Why do we give presents at Christmas? The hustle and bustle of the season sometimes obscures the reasons for this tradition. It is, however, a tradition grounded in history. The custom also expresses a human need to express our thanks and affections. The custom of giving presents during the middle of winter dates back long before the birth of Jesus. Many early cultures, such as the Romans and the Norse, had winter solstice festivals that included gift giving. This tradition was eventually incorporated into Christianity. Christians cite the Three Wise Men, or Magi, as the Biblical context for giving presents during the Christmas season. The Magi brought gifts of gold, frankincense and myrrh to the Baby Jesus in the manger. These precious items showed the respect and reverence the Wise Men had for the Son of God. Christians likewise bestow presents on family members, friends and the needy as a way of remembering the Three Wise Men honoring of the Christ Child. A modern interpretation of the custom is the recognition that Christmas is Jesus' birthday. Since giving material birthday presents to Him is not possible, we instead give gifts to each other in celebration of the day. So Why Do We Give Gifts at Christmas? The season is a traditional time for giving presents. But there are personal reasons for why we give Christmas presents and to whom. The motivations vary by the individual, but there are some common themes. Christmas presents are a time to surprise and delight those we love. We enjoy finding that perfect gift. Once wrapped and delivered, we watch the recipient's happy face as he or she unwraps it. There is also something special about children's anticipation and hope during this time of year. Little hands can barely stay away from the wrapped presents under the tree. Adults reflect back to their own childhood Christmases with nostalgia and fondness. Businesses use this time of year for promotion and advertising. 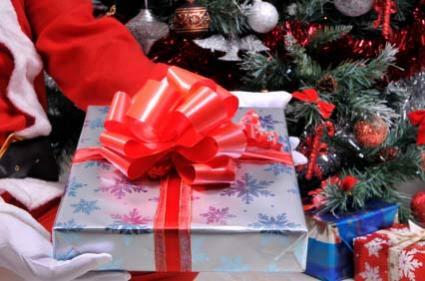 Many firms will send presents to valued clients to thank them for their business. Gift giving is also a way to advertise the company and promote positive public relations. Businesses also give gifts to employees to express appreciation for the work during the previous year. Sometimes these presents are in the form of money, like a Christmas bonus; other times they are in the form of gift certificates. Another common gift giving custom is to donate to charities. In keeping with the Christian ethic of helping those in need, donors give money or donate items, such as food and clothing. Christmas donations are a significant part of many non-profits yearly fundraising budget. While the reasons for giving presents vary, this custom has made the Christmas season full of surprises and joy. The tradition is centuries old, but still reminds us of the magical birth in a stable so long ago.